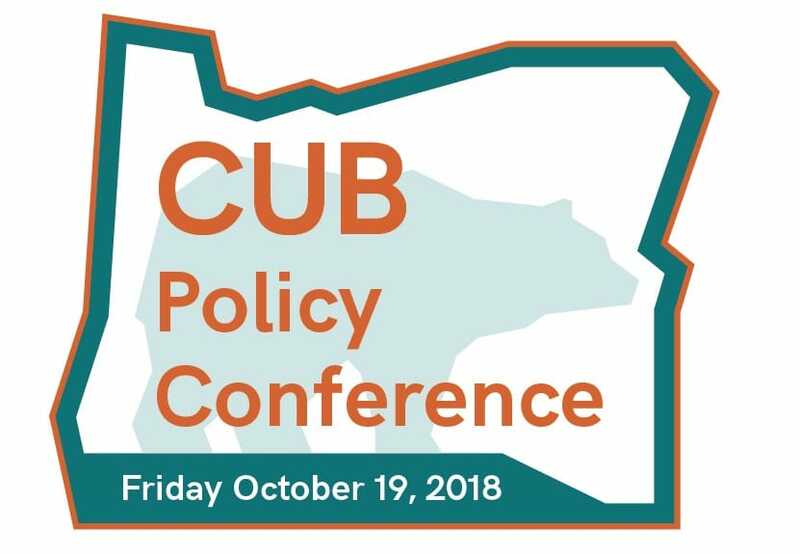 The eighth annual CUB Policy Conference will take place on Friday, October 19, 2018 at the Downtown Portland Hilton. Registration for Destination: Decarbonization, is now open! Early Bird pricing is in effect through Friday, September 28. 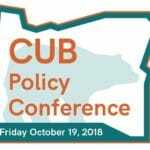 This CUB Policy Conference is specifically designed to educate analysts, attorneys, advocates, regulators, utility executives, and others working in and around the energy industry. CUB will be applying for Continuing Legal Education (CLE) credits for this conference from the OR and WA Bar associations. “Information and communications technology (or technologies)” describes the world of Internet-enabled devices, applications, and network infrastructure that, when combined, connect a diversity of end users, including utilities (both energy and telecommunications) and their customers. This ever-expanding, connected universe of individuals, businesses, governments, nonprofits, and utilities presents new opportunities and challenges for these groups to meet broad societal needs – especially those experiencing cultural, economic, or other imposed barriers. This panel will discuss these issues, as well as the role and possible downside of employing information and communications technologies to drive sweeping decarbonization. Decarbonization efforts increasingly occur at neighborhood and community levels. Local efforts frequently address a multitude of goals beyond energy efficiency and renewable energy projects to reduce greenhouse gas emissions. For instance, ensuring a more just transition for communities hurt first and worst by climate change is a major motivation for interconnecting energy improvements with job training and affordable housing development without displacement of low-income residents. Integrated local efforts can result in greater community resilience with alignment of economic benefits as well as health, livability, and decarbonization goals. Legislatures across the country are moving toward decarbonizing the economy. Gas utilities have started to explore innovative programs such as power-to-gas and renewable natural gas installations as we integrate into a low-carbon, renewable energy future. What role do natural gas and the existing natural gas networks play in a decarbonized world? Can the existing distribution network be adopted to provide carbon neutral fuel to customers? What are local gas utilities in Oregon doing to address these changes? The Pacific Northwest has been a leader in energy efficiency. We have invested millions in making our homes and businesses more efficient. Only recently have we turned our attention upstream – to the grid that delivers power. How can we make the grid more efficient? Is it possible that storage, demand response, and distributed generation can make the distribution grid more efficient and reduce distribution investments? Can expanding the Energy Imbalance Market into a more integrated western grid reduce curtailment of renewables? What role does a more efficient grid play in enabling a decarbonized electric sector? The times, they are a changin’. New technologies, forward thinking policies, and regulatory and legislative changes across the country are modernizing the grid and electricity system at an accelerating rate. Utility commissions are grappling with whether the existing utility business model and regulatory apparatus is ideally situated to manage the utility system of the future. Does the current utility system provide sufficient incentives for utilities to invest in burgeoning technologies like energy storage and demand response? How should utilities with an increased level of distribution-system generation and flexibility be regulated? Which metrics and incentives should be placed on a utility in a decarbonized world? Should Oregon’s vertically integrated investor-owned utilities continue to own generating assets, or should increased competition, including an expanded role for regional energy markets, be explored? Carbon emissions from the electric sector have started to decline and this will continue as regional coal plants are shut down. While this trend is important as we work to mitigate global warming, science tells us that we need broad carbon reductions from across the economy, not just from regulated sectors. How do we transition from thinking about carbon risk in utility planning to decarbonization of the economy? What is the role of utilities and the federal hydro system in broader efforts to decarbonize? What policies are needed to drive economy wide carbon reductions?